If your string of beads or pearls breaks, don't try to knot the old one and reuse it. You will need to restring the beads onto a fresh piece of cord. Keep the beads on the old string until you are ready, then follow these simple directions to restring the necklace. Work on a piece of fabric that has some "nap," such as velvet or something with a similar texture. This will prevent your beads from rolling away quite so much. Also, you may want to work at a desk or table with a box or drawer in your lap to catch any beads that do roll away. Leave the beads on the original string, if possible. This will keep them in order until you need them. Cut a piece of nylon cord or beading cord (can substitute dental floss) 12 inches longer than the length of your original necklace. 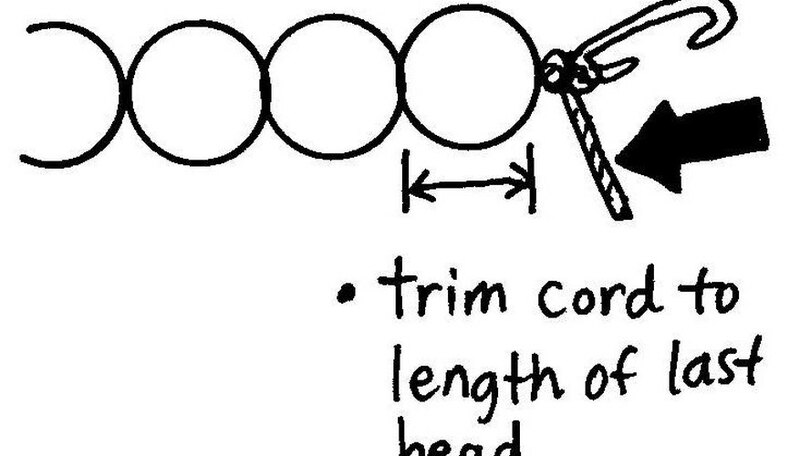 Make sure the cord is thin enough that it can pass through a bead twice, doubling back on itself. Thread a needle with the cord and tie a knot 1 1/2 inches from the end. Slip the beads, in order, over the needle and onto the cord. 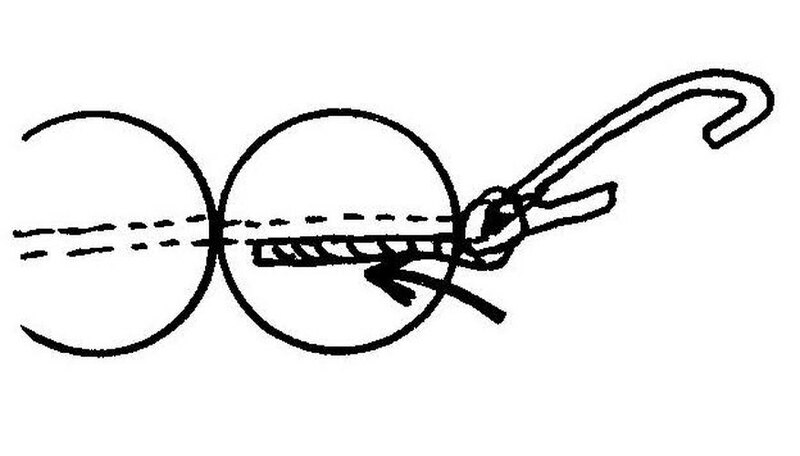 When all the beads are strung, tie a double knot at each end, using the technique shown above. Make sure the beads are secure before tying to add the clasp. When all the beads are strung onto the new cord, attach a clasp. If the clasp on the old necklace is reusable, you may want to cut it off and reuse it. Otherwise, buy a new clasp. Take the extra bit of cord hanging off one end of the necklace and insert it through one part of the clasp (the clasp should come in two pieces). Make sure you've inserted the cord through the eyelet designed for attaching the clasp to the necklace. 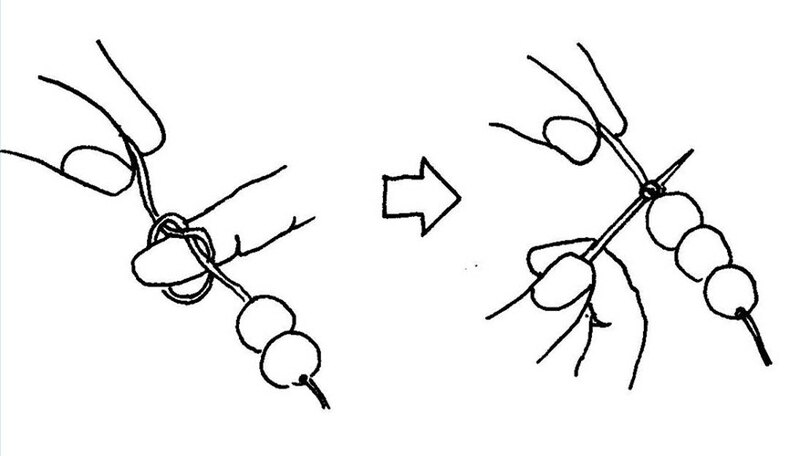 Tie the knot using the technique illustrated in step 6. Do the same to the other end of the necklace, using the other piece of the clasp. Tie the knot using the technique illustrated in step 6. Trim off the end of cord, leaving a length equal to that of the of last bead. Tuck the end of the cord back into the last bead. Do the same on the other end. If you have trouble tucking the end of the cord back into the bead, try putting some white glue on the end of the cord, twirling it straight, then letting it dry. The straight, stiff cord should go into the bead easily. RuthJ is the author of a student guide to Beowulf, published by Greenwood Press. She is currently writing a book on the technology and material culture of the Middle Ages. She taught her kids at home for many years and learned many offbeat things.